Ever since I started riding up Mt Lemmon I’ve been intrigued by the gully that leaves the first hairpin and heads straight up the hillside, aiming for an evil looking black slot – which I think of as the Black Gate of Mordor. I finally scrambled all the way up it on 12/29/2017. There is some class 3 scrambling, a bit of class 4, and a fair amount of loose rock in the upper section. Park at the parking lot just before the first hairpin on the Mt Lemmon Road. 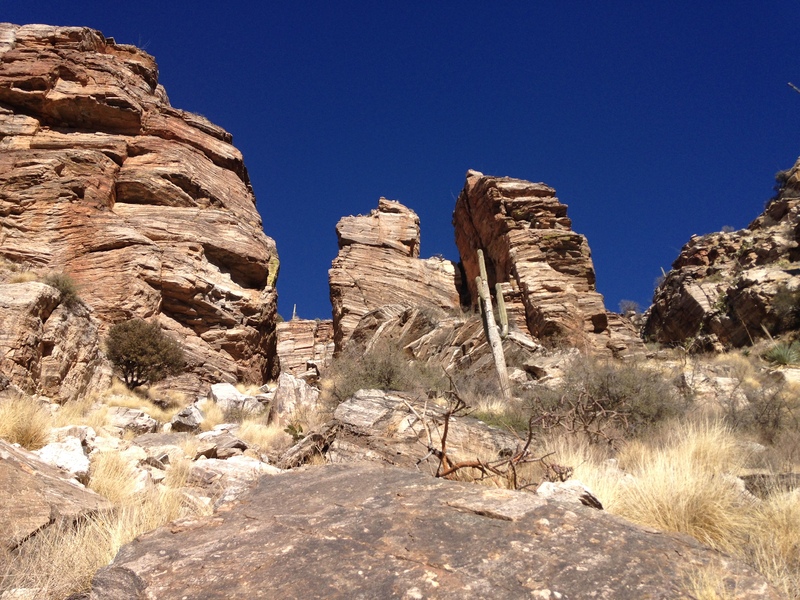 Start hiking and scrambling up the canyon on beautiful white rocks. You can skirt many of the obstacles but it’s fun to try and climb a fairly direct line up the canyon. There’s quite a bit of class 3, and some class 4, depending on which boulders you want to climb over. Shortly after the line of cliffs on the right in the above photo, the beautiful boulders end and another canyon heads off to the right. This is Soldier Canyon and is a much better hike and scramble than the Black Gate of Mordor. Still, if you insist on going straight up, keep going. The terrain changes: it becomes steeper, narrower, and much grassier. There are still rock steps to climb but also a lot of loose rock and grass to navigate. Eventually you reach the Black Gate, the narrow slot between two vertical cliffs. Climb up between the two cliffs, and very soon you will reach two shorter cliffs, with some difficult moves to exit. Now nothing but a steep grass and dirt slope lies between you and the ridge line. At the ridge line you can either descend the way you came, or turn right and continue up to the little “summit”, being careful to avoid the shin dagger cactus. From here it appears from photos that you can scramble down southwards then follow a wide ridge down to Soldier Canyon. However, I chose to make a longer hike of it and at the summit I turned left and followed a faint trail until I could head off to the right and down steep slopes and gullys until I reached Soldier Canyon. Be careful as you start the descent as there a band of cliffs that you need to avoid. I can’t give precise directions as I was exploring the different possible descents, but if you have the skills to make the ascent through the Black Gate, you will be able to find a descent. Once at the bottom, in Soldier Canyon, turn left and climb slabs and rock steps until the canyon splits. Take the right hand branch, and where it seems that it dead ends in a cliff you will find class 3 ledges and shelves that climb up left then right then left, leading you to the base of a smooth cleft that leads to an enormous boulder that blocks the way and looks terrifying to climb past. For fun, climb the smooth cleft to below the boulder, then return. Now climb up the slope on the right hand side. Eventually you will top out a few feet below the well-traveled path of Soldier Trail. Turn right and follow this back down to the Mt Lemmon Road, which you reach about 1 mile above your car.